Manual: 46pp black & white print double sided on 100gsm bond. Cover (1 x Front, 1 x Back) gloss laminate in colour 300gsm satin. Wire bind finishing. Published in 2017. Parent Scoring Booklet: 12pp, self-cover on LIGHT PINK 80gsm, double sided black & white print, A4 size, saddle stitch finishing. 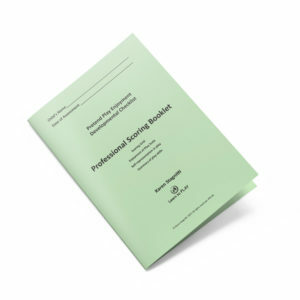 Professional Scoring Booklet: 8pp, self-cover on LIGHT GREEN 80gsm, double sided black & white print,A4 size, saddle stitch finishing. The Pretend Play Enjoyment Developmental Checklist (PPE-DC) is a criterion referenced assessment with standardised administration and scoring. It is an observational assessment that takes between 15 and 30 minutes to administer. It is suitable for children aged 12 months to 5 years. The examiner chooses the play materials which would be suitable for the setting and the child. Children can be assessed in a group or one-on-one assessment settings. 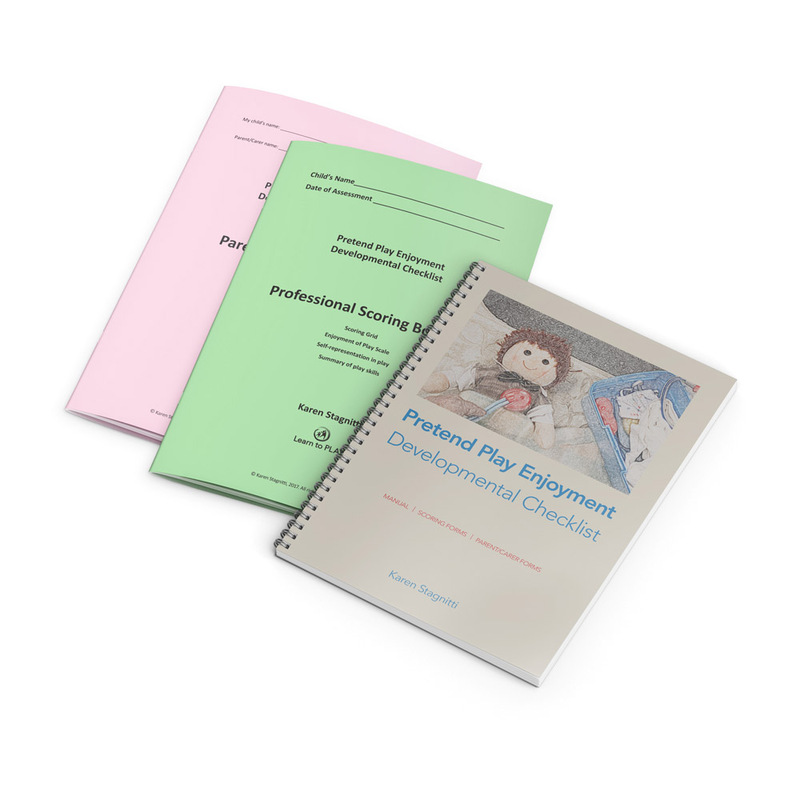 The PPE-DC includes the manual, the Professional Scoring Booklet, and the Parent/carer Scoring Booklet. The PPE-DC assesses three aspects of a child’s play ability, which are: pretend play skills, enjoyment of play, and a child’s sense of self (their self-representation as observed during play). 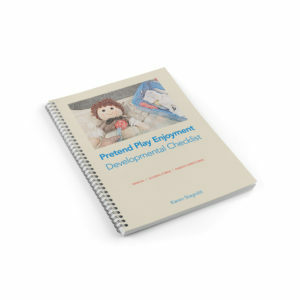 The PPE-DC assesses a child’s pretend play ability across the skills of: play scripts; sequences of play actions; object substitution; doll/teddy play; role play; and social interaction. There are six symbols which are used to score the quality of play and ability of the child. The symbols indicate spontaneous play ability, quality of imitation, joining in the play, focussed attention, and no ability. The child’s enjoyment of play is scored on a 0 – 6 rating scale using the Enjoyment of Play Scale. A description is given of the child’s behaviour and play reflecting the child’s self-representation, understanding of mental states and theory of mind. The manual contains detailed information for administration, scoring and interpretation. 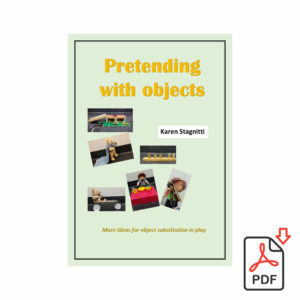 Descriptions of pretend play across the six skills; categories of enjoyment; and the developmental changes in self-representation, mental states and theory of mind are given in the manual. 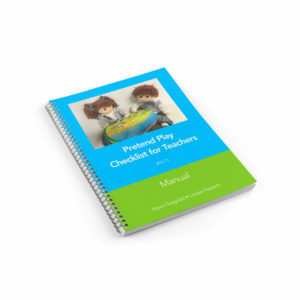 A summary of pretend play ability, enjoyment in play and self-representation is given in the scoring booklets for ease of scoring. Interpretation of the PPE-DC provides insight into the child’s ease of engagement in therapy to build play ability, and the child’s ability to engage in and enjoy spontaneous pretend play with reference to their sense of self through play. The PPE-DC is a new assessment that is unique in the combination of abilities that are assessed. This provides insight into areas of a child’s development that are often not considered and which impact on a child’s language, narrative, social competence, problem solving, and sense of autobiographical narrative.